Background: Molecular imaging of cancer cells using effective drug targeting systems are most interested research area in recent years. Albumin protein is a soluble and most abundant protein in circulatory system. It has a ligand-binding function and acts as a transport protein. Researchers are interested in developing albumin based nanostructured specific anti-tumor drugs in cancer therapy. Pancreatic cancer treatment or drug design for targeted pancreatic cancer cell has great importance due to it has a high mortality rate comparing other cancer types. Objective: In this article, our goal is to develop new targeting nanoparticles based on the conjugation of albumin and Hyaluronic Acid (HA) for pancreatic cancer cells. Method: In this article, we proposed a new technique for conjugation of albumin (BSA) and HA in nano formation. Firstly, cationic BSA is synthesized. Then, BSA-HA conjugation is obtained by interacted cationic BSA with 1000 ppm HA. 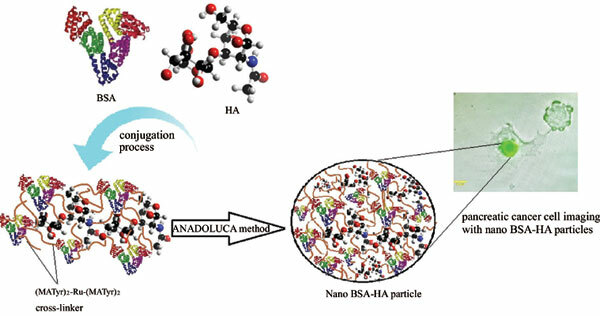 Secondly, nano BSA-HA particles and nano BSA particles were synthesized according to AmiNoAcid Decorated and Light Underpinning Conjugation Approach (ANADOLUCA) method which provides a special cross-linking strategy for biomolecules using ruthenium-based amino acid monomer haptens. After characterization studies, in vitro cytotoxic activity of synthesized nano BSA-HA particles were determined for PANC-1 ATCC® CRL146 cells. Results: According to the data, nano BSA and nano BSA-HA particles synthesized uniquely using special ruthenium-based amino acid decorated cross-linking agent, (MATyr)2-Ru-(MATyr)2.based on ANDOLUCA method. Characterization results showed that there was not any change in protein folding structures during nano formation process. In addition, nano protein particles gained fluorescence feature. When interacting synthesized nano BSA and nano BSA-HA particles with pancreatic cells, it was found that BSA nanoparticles were usually around cells and membranes, but BSA-HA nanoparticles were identified around the cells, in the cytoplasm inside the cell, and next to the cell nucleus. So, nano BSA-HA particles could be used as cancer cell imaging agent for PANC-1 ATCC® CRL146 cells. Conclusion: The satisfactory conclusion of this study is that synthesized nano BSA-HA particles are fundamental materials for targeting pancreatic cancer cells due to HA receptors located on pancreatic cancer cells and imaging agents due to fluorescence feature of the BSA-HA nanoparticles. Albumin nanoparticles, hyaluronic acid, ANADOLUCA method, pancreatic cancer, cell imaging, HA receptors.